Nathan is a certified Strength and Conditioning Specialist through the NSCA, a certified level 2 Sports Performance Coach through USA Weightlifting, and was a certified a Strong First Girya Instructor from 2009 to 2018. He holds a MS in Kinesiology from Cal Poly, SLO. Nathan assisted at a SFG(certification) for the first time in November, 2015. His experience includes working as a physical therapy aide at the Body and Balance Center in San Luis Obispo and as a volunteer aide at Bell Trace in Bloomington, Indiana. At Bell Trace, he treated shoulder, knee, hip, and back injuries. 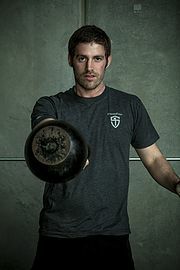 Since then he has gained experience in the fitness field through working at the Cal Poly Rec Center as a personal trainer, as well as helping with strength and conditioning for a local kickboxing team. Nathan has trained with and learned from the likes of well known and influential trainers in the strength and conditioning community including Dan John, Pavel Tsatsouline, Doug Nepodal, Brett Jones, Jeff O’Connor, Max Shank, Kelly Starrett, Sean Waxman and David Whitley. KT is a Cal Poly graduate with a MS and BS in Kinesiology and a certified Strength and Conditioning Specialist. She is a certified level 2 Sports Performance Coach through USA Weightlifting as well as being newly certified by Waxman’s Gym for Olympic barbell training. KT has also been training “Russian style” kettlebells since 2010, originally learning from the RKC, then making the switch to Strong First to continue learning from Pavel Tsatsouline. In her undergrad she worked with Todd Hagobian, Ph.D., as a research assistant examining exercise’s effect on appetite hormones, resulting in KT becoming a published co-author for the study. Additionally she was an assistant coach for SLO High School’s shot put and discus throwers from 2009 to 2011 and Mission Preparatory High School’s Strength Coach from 2015 to 2017. As a graduate student, KT taught exercise physiology and biomechanics labs while conducting her thesis comparing the effects of motor learning principles on strength training program design, with Kellie G. Hall, Ph.D. In addition to her position at STF, KT has been a part-time lecturer at Cal Poly in the Kinesiology department since 2014.